The coach, thankfully, had brought a few lawn games to entertain the boys. My son and two of his friends were instantly drawn to a set of two foam disks with elastic material inside, and a “hairy” ball made with rubber filament. Like many disk/ball games, the goal was to hit the ball back and forth to each other without letting it hit the ground. Since there were three kids, and only two disks, they developed their own game. Kid 1 bounced the ball off his disk to Kid 2, then tossed his disk to Kid 3. Kid 2 bounced the ball to Kid 3, then tossed his disk to Kid 1. Then Kid 3 bounced the ball to Kid 1, and tossed his disk to Kid 2. They were concentrating hard on bouncing and tossing, but also laughing continuously for at least half an hour, until the next group of kids convinced them to give them a chance to try the game. “We gotta get that game, Mom!” my son yelled over his shoulder on his way to play in the pond with the pals. So, when I was at a local discount store a week later and saw a “similar” disk game, I got it and proudly presented it to my son. After 2 minutes of playing with it, he rattled off the 12 things wrong with it, and how much better the one he played with in Vermont was. In other words: Mom fail. Along comes OgoSport to the rescue! A Madison Mom was recently contacted by OgoSport to check out their various sets of OgoDisks. “Can it really be the same ones my son adored?” I hoped. I showed him the picture, and his eyes lit up—yes, it was! And not only was it the same brand, but there were multiple versions of them! The Mezo (also known as Max), the Mini, and the Grip! Woa! Sign us up to review them! In other words: Mom score! 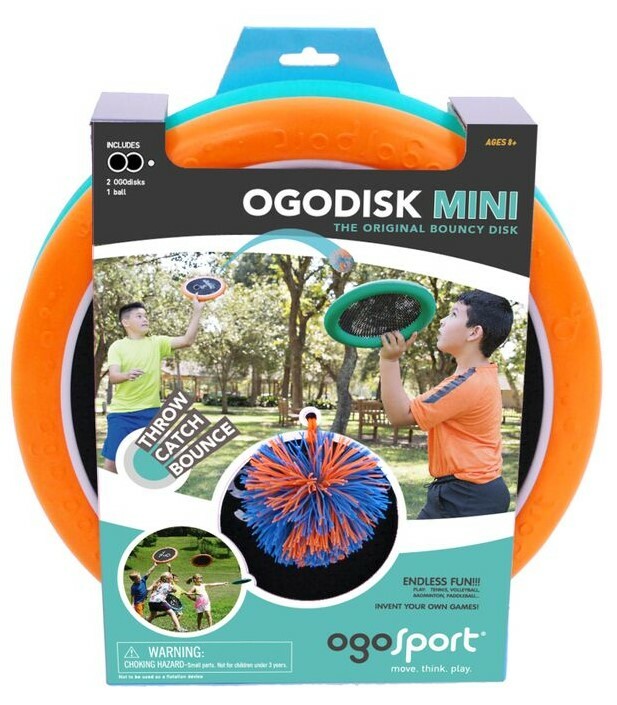 The name OgoSport comes from the company’s motto “Oh Go Outside and Play.” But, as my family has learned, many of their products are just as good played inside as out. As the colder weather approaches, I was excited to find that these disk games are perfect for basement play (and, according to my son, for playing in the hallway, or against the staircase, or in the living room—can you tell that our family is much more in to play than keeping a formal home?). The boxes suggest many ways to play, including using the disks with water balloons (obviously outside!) and playing like volleyball, tennis, or baseball. My son and husband didn’t need to have a box tell them these ideas, though. After testing the games in the hallway, they went right down to the basement—our indoor Land of All Sports! They used tape to line the boundaries of play, and determined the rules (players must remain on their knees—no standing; playing off the ceiling is allowed once per volley; no limit on use of the walls, etc.). After a few rounds, they came back upstairs to gather our travel pickleball net from our garage (I think we have equipment in our house for every sport known to man, trust me! ), and set it up across the basement. (In the warmer weather, I’m sure we’ll be playing with the net and disks on the driveway, too.) Let’s just say, the knees on their pants are taking quite a beating with how much they are playing in the basement! My daughter and I also joined in for a round robin tournament. Tons of laughter! We’ve tried all three types of OgoDisks, and, honestly, love them all! We liked the Grip ones with the handles for playing with the net, but I think the most versatile one would be the Mezo since you can more easily toss it like a flying disk. Also, the softer ball that comes with the Mezo and Mini is definitely better for little kids. My son does like the unpredictability of the bounces of the Flux Ball that comes with the Grip, though, either to play with the set or bouncing on its own. Based on the level of activity of the boys in Vermont, and how much we have used the new sets we received, these disks are high-quality and stand the test of time. 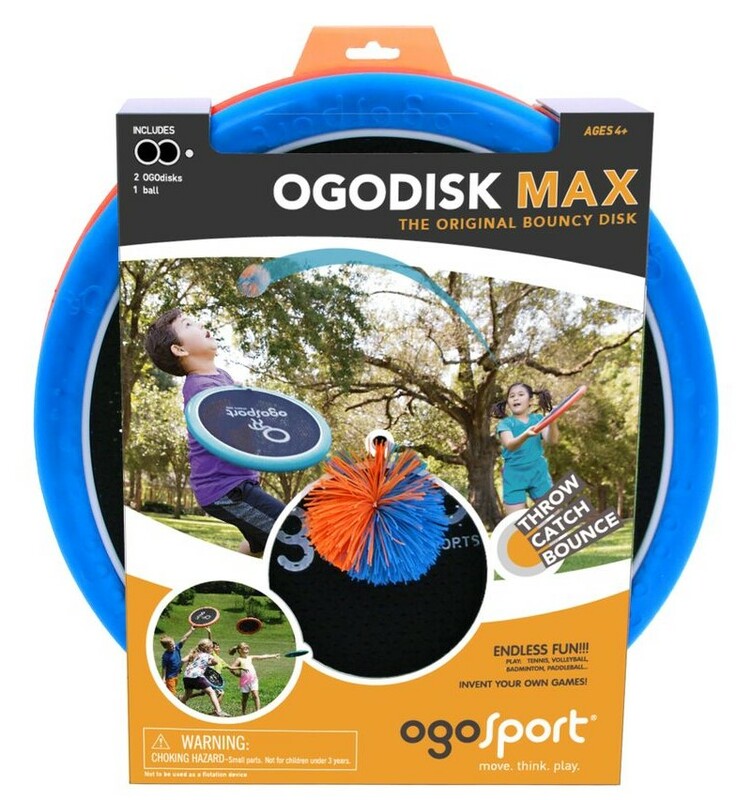 I highly recommend these OgoDisk games, for play inside and out!